I wake and for a few seconds savor the uncharacteristic stillness of my neighborhood and the chirping of birds, agog: “I got the best crusts of panettone for christmas!” “The people in #3L gave me brioche crumbs!” Then I turn on all the holiday lights and put on my favorite holiday albums–Stevie, Jackson 5, Vince Guaraldi, Otis, the Supremes, Smokey, Mariah (yes), Prince (double yes). 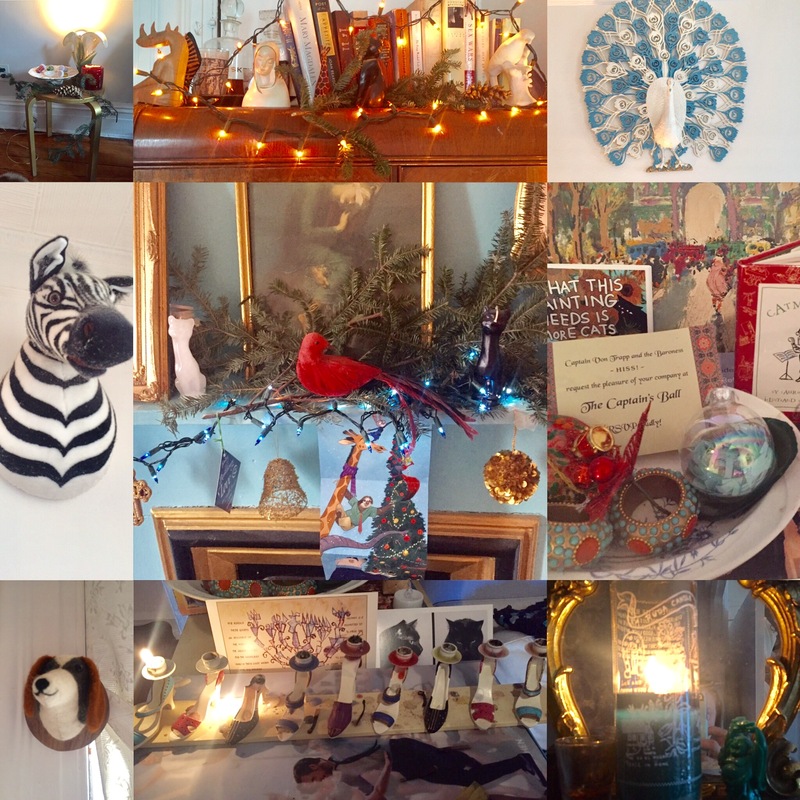 I’ve decorated my whole front room in a mermaid pagan Jewish Middle Church menagerie of gold and blue lights, green and red candles, birds and giraffes and cats, pine cones and pine branches (rescued from deli trash, for reals), and blessed blessed menorahs and Mother Marys. This is how I pierce the darkness of ambiguity and abnegation–with my own admixture of faiths, inherited and inspired. First and foremost: what pleases my inner 8-year-old, forever tapping her foot and mending her heart. Sparkling and soaring, that’s what she likes. So I decorate what I can, breathing in the joy of time with my loved ones in days before and to come (gosh, I’m the luckiest lady), and allow the loveliest permakitten to arrange herself decorously on my lap. From here I can dream up anything.